Boil Pasta Shells as per directions on box and cook to al dente. Drain and let it cool until easy to handle. Sauté onion and garlic until tender. Add beef and sauté until brown. Add salt and pepper and oregano. Pour in Ragu sauce then cover and simmer for 15 minutes or until heated through. In a big bowl, mix the Ricotta cheese with the egg, mozzarella, parmesan, salt and pepper. Squeeze out all moisture from thawed spinach by wrapping in a paper towel or clean dish towel. Add to ricotta mixture and stir until blended. Stuff cooked shells with ricotta combination and lay flat with open side facing up. Preheat oven to 350 degrees. Pour about 2 cups of the meat sauce on the bottom of a 9 x 13 casserole dish. Add stuffed shells on top of sauce, still with open side facing upwards. set Spoon the rest of the meat sauce on top. Completely cover top with mozzarella cheese and parmesan. 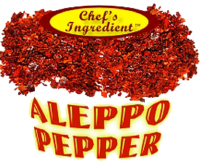 Cover with aluminum foil and bake at 350 degrees for 45 minutes, remove cover and bake for another 10 minutes. Use a little Ziploc baggy with the corner cut out to pipe the filling into the shells. Can prepare early in the day and refrigerate and then baked for dinner. 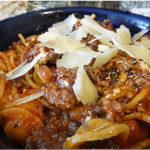 --If using oven-Ready Pasta add 1 cup of water to meat sauce mixture. 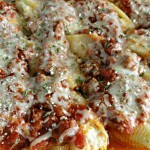 --Can use Catelli Express Cannelloni if large shells hard to find. 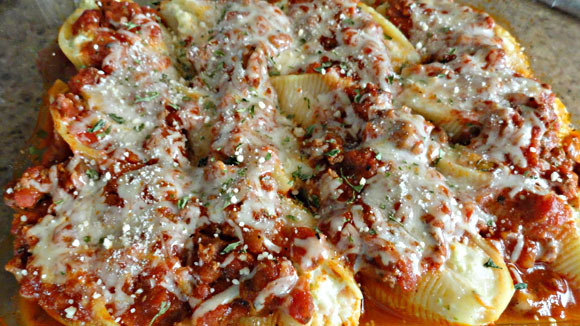 The Catelli Express cannelloni (Red Box) is perfect and you will have exactly the right amount of cheese mixture to stuff all the cannelloni without any leftovers. The Cannelloni was delicious. 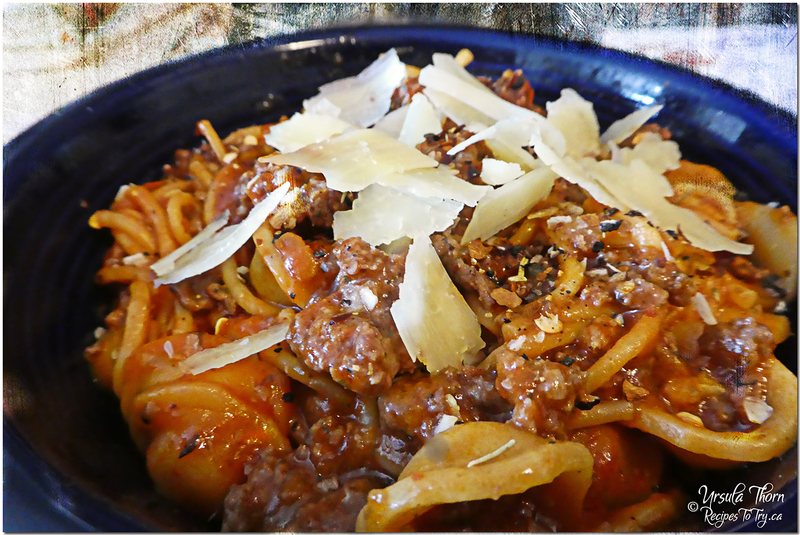 --The 340 gm bag of Mozzarella cheese will give you the 3 cups this recipe calls for exactly.